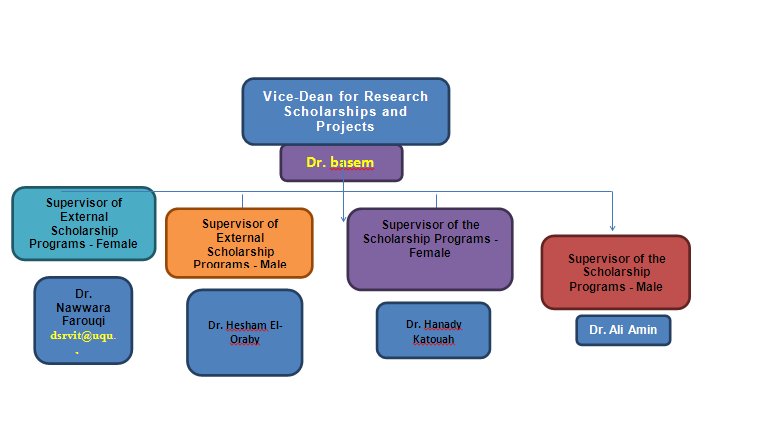 The Vice-Deanship of Scientific Research for Research Scholarships and Projects was established pursuant to decision no. (4,360,014,026) issued by the President of Umm Al-Qura University on Muharram 27th, 1436H (corresponding to November 20th, 2014). It is affiliated to the Deanship of Scientific Research and included in its organizational structure. Introducing and providing research opportunities in a manner that ensures the fulfillment of requirements of the national research development and UQU strategic dimensions. 1. Exploring research areas in order to serve economic mobility in Saudi Arabia. 2. Proving every possible support for research projects inside and outside the university. 3. Receiving newly-enrolled students and integrating them into an environment of research projects. 4. Giving the teaching staff the chance to submit research proposals. 5. Introducing new research opportunities to graduate students. 6. Offering an opportunity to write books and scientific references. 7. Hosting and arbitrating in research competitions. 8. Overseeing research projects, providing them with technical and financial support, and evaluating their outcomes. 9. Spreading the culture of scientific research inside the university and identifying bases and standards of high-quality researches. 10. Identifying mechanisms on how to apply for internal and external research scholarships. 11. Providing support for the university’s employees throughout the period of research proposal submission.